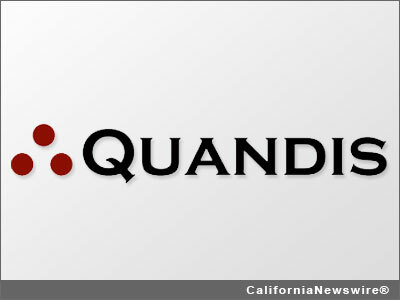 FOOTHILL RANCH, Calif. /California Newswire/ — Quandis, Inc., a leading provider of default management technology and Web-based solutions, today announced that it has developed a number of different new integrations between its clients and the technology platforms that are used to place and securely transmit data on completed valuation orders. Quandis' valuations system enables organizations to efficiently manage the placement, receipt, distribution and delivery of valuation orders. The solution provides a centralized Web portal that allows brokers and appraisers to accept orders and complete valuations online. However, as lenders and servicers continue to engage multiple vendors to handle the lifecycle of the valuation process, Quandis started placing a greater emphasis on integrating with other technologies to accommodate increased demand. This allows the lender/servicer to house national real estate information and build a data warehouse to better manage the value analysis of their loan portfolios. New integrations that Quandis developed include, but are not limited to, default servicing platforms, best-of-breed software applications, third party services, Web portals and homegrown systems. Quandis' solutions are engineered with contemporary architecture to be highly flexible, scalable and utilize Web services for ease of integrations. "Our valuations system handles the full processing of orders using our own platform; however, many organizations opt to enlace themselves with several different vendors," said Laura Hadley, vice president of product development at Quandis. "In terms of why we began to focus on creating new interfaces, it simply boils down to our desire to serve clients well and accept orders initiated from different mediums-whatever they may be." Quandis says it will continue to add new integrations with other technology platforms and enhance existing integrations in an effort to facilitate ease of doing business and expand its reach to end users. Founded in 2003 and headquartered in Foothill Ranch, Calif., Quandis is a default management software provider specializing in Web-based solutions for the lending industry. Quandis' solutions include foreclosure process automation, short sale portals, skip tracing systems, a valuations hub, military search services, bankruptcy status searches, collection solutions, vendor solutions, as well custom application development. The company's clients range from lenders to banks, servicers, foreclosure attorneys, GSEs outsourced service providers, and agents and brokers. With over 20 years of experience in developing mortgage technology solutions, Quandis understands the unique requirements necessary to deliver enhanced workflows and business-to-business communications. Quandis has been named a Top 50 Service Provider three years in a row. For more information, please visit http://www.quandis.com/ or call (949) 525-9000.